I'm not sure what I've been waiting for, but this post has been in the draft folder for 6 weeks. Homemade Cheese Ravioli. I love pasta. I love cheese. And when TXSIL was visiting in July, she offered to teach me how to make homemade ravioli. I was pretty excited! Homemade pasta is not something we've tried. Every so often we think, oh, how difficult can it be, maybe we should buy the stand mixer pasta roller attachment, wouldn't homemade pasta taste good. But we never do. TXSIL has been making homemade pasta for a while (and homemade gnocchi, too, something else we want to try) and she swears it's quite simple, if a wee bit time consuming until you get the hang of it. So on a rainy Tuesday in July, as the nephews watched The Simpsons movie and BIL... did something... and SP was at work, TXSIL and I embarked on a ravioli adventure! The cheese filling. Much like lasagna filling: ricotta, shredded mozzarella, shredded parmesan, fresh basil & oregano, salt & pepper, and egg. The homemade pasta dough: flour, water, eggs, salt. She makes her pasta dough in the stand mixer, using the paddle and then the dough hook. The workout: rolling the pasta dough. I suppose you could use a rolling pin. You could buy/use the stand mixer attachment. 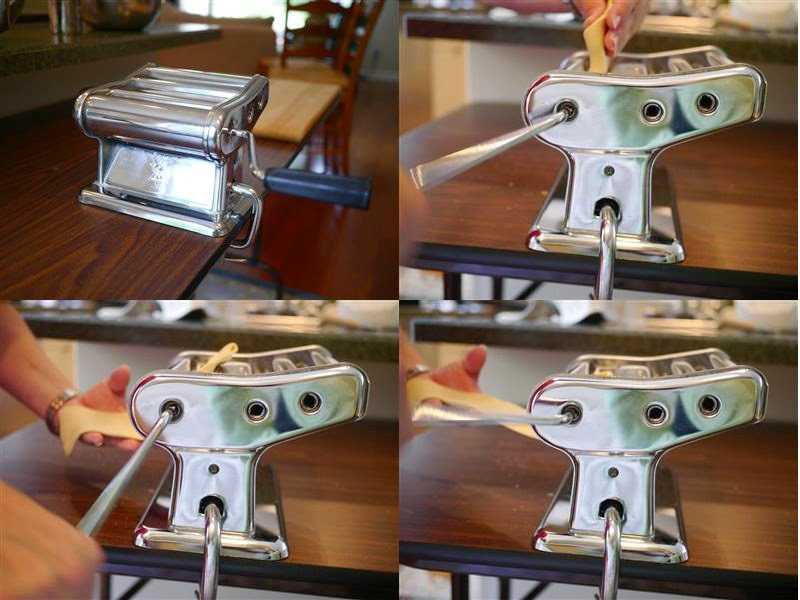 Or you could borrow your MIL's hand crank pasta roller, which SIL did. The ravioli adventure almost came crashing to a halt when we discovered the countertop was too thick for the machine's clamp. Uh-oh. We ended up bringing up a Costco folding table from the basement and clamping the machine to the edge. I was a little worried about stability, but it seemed OK as we continued. I wish I could say it looked easy, but, nope. I was glad I was not the one feeding each blob of dough through 3 times to get the proper thickness. Lots of cranking. It looked like a great arm workout! But also it looked tiring. And a little annoying. SIL has this kind of hand crank pasta roller at home. The previous day, at her MIL's house, she had helped her MIL try out her recently purchased KitchenAid pasta roller attachment. SIL says that it took a bit to get the hang of it, and that while she doesn't mind (too much) the hand crank, the stand mixer attachment makes it so much easier and faster. I think if SP & I decide to pursue this homemade pasta business, we'll splurge on the stand mixer attachment. I know I won't be able to do that much hand cranking of pasta dough, and I'm pretty sure he'll end up despising homemade pasta if he has to hand crank all that pasta dough! SIL brought her ravioli mold with her, all the way from Texas! While she was cranking dough, I sat at the other end of the table. In front of me was our wooden rolling board, the ravioli mold, a rolling pin, a cookie sheet, the bowl of cheese, and lots of extra flour. Flour seems to be key when working with pasta dough. The hand crank roller didn't allow her to make a good enough and wide enough sheet of pasta to cover all 10 ravioli spaces, so we did just 5 at a time. Dip the sheet in flour, place flour side down on the ravioli mold. Gently press down in each ravioli section to make a depression for the cheese. Spoon in cheese. Dip the next sheet of pasta dough in flour. Place it, flour side up, on top the cheese pasta. Using the rolling pin, roll over the pasta dough/ravioli mold to seal the edges and 'cut' the individual ravioli. Turn the mold over and give it a good whack to release the ravioli. Place them on a floured cookie sheet. Optional: make a hole with a toothpick in each ravioli to help prevent bursting during cooking(I did this in maybe half the ravioli, but so far, none have burst so I'm not sure how much it really helps). When a cookie sheet is full, put it in the freezer for 1-2 hours, until the ravioli are frozen and ready to be stacked in a container (we put wax paper between each ravioli layer in our plastic container). To cook, boil water, add ravioli directly from freezer (no need to thaw), and boil 13-15 minutes. Top with sauce of your choosing (we made a quick marinara sauce) and maybe some fresh basil and enjoy! These are really good! I am quite impressed with my 'sealing shut' skills - like with the pierogie, so far, none of my ravioli have burst open! My arms got tired towards the end and I couldn't push down enough to cut/separate the ravioli so I used a fluted dough cutter to separate them. A HUGE thank you to TXSIL for making us 5 dozen ravioli! We only have about 15 left - we just ate some last week and they still taste really good, so we know they can be frozen for at least 6 weeks. We both still want to try making our own pasta - we'll see if we actually try it! It sure is tasty! In stand mixer fitted with paddle attachment, dump in flour and make a well in the center. Add a pinch of salt. Add the eggs and 2 tbsp warm water. Mix until the ingredients are blended. If the dough seems dry and does not form into a ball, add more water. If the dough is sticking to the sides of the bowl, add a bit more flour. Change over to the dough hook attachment to knead the dough. Do not set the mixer higher than 2. Knead until the dough is soft and pliable, about 5-10 minutes. If the dough hook is having trouble (it slows down, almost to a standstill) the dough is probably too dry so add a little more water. It's ready when you have a nice, soft dough ball and the dough doesn't stick to the dough hook or the bowl. ***We got about 5 dozen ravioli because we made about 1.5 batches of pasta dough and about 1.5 batches of cheese filling. Also, TXSIL thinks she may have rolled the pasta sheets a bit thicker than she usually does.